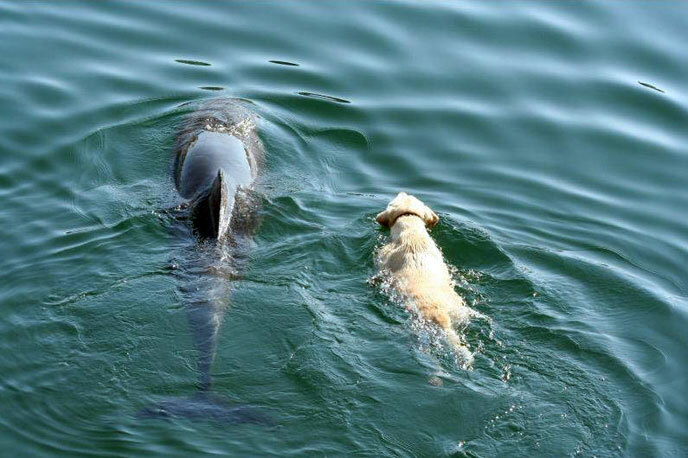 The close friendship of Duggie the dog and Ben the dolphin is a source of amazement and delight for the people of Tory Island in County Donegal, Ireland. Duggie and Ben were featured on the BBC's "CountryFile", and you can check out some footage from the programme of them playing together here (do check it out - it's worth it!). The unlikely duo first met in the local harbour when Duggie was attracted to the bubbles Ben was blowing to entertain himself. They soon became friends, spending hours in the water playing together each day. Sometimes Duggie swims hundreds of metres off the shore alongside Ben, seeming to forget that he is not himself a dolphin, only to find himself at the point of exhaustion far out in the deep water. Fortunately, Ben is there to look after him. When Duggie becomes tired, Ben ducks under the water and, supporting Duggie from underneath, swims him to the safety of the shore. Ben is not the only dolphin to have bailed out an imperiled pooch. According to the Huffington Post, in 2011, Turbo, an 11-year-old doberman who had fallen into a canal on Marco Island in Florida, was similarly rescued by dolphins. Turbo had been missing for 15 hours when locals were alerted to his distress by persistent splashing emanating from the canal. When they reached the water, they found Turbo surrounded by a pod of dolphins, thrashing in the water as if to attract their attention. Many species interact in the wild, usually as predator and prey, but these stories suggest that dolphins are capable of feeling empathy toward, and enjoying the company of, other animals. And when it comes to playing, dolphins by no means restrict themselves to humans or man's best friend. To be assured of a smile, check out this footage of a fascinated dolphin playing with a cat on the back of a boat. Recent encounters between wild humpback whales and dolphins hint that their interactions also have a playful side. According to an American Museum of Natural History Science Bulletin, biologists have observed whales off the coast of Hawaii repeatedly lifting dolphins out of the water, and letting them slide down their heads back into the water. As the dolphins were clearly cooperating, and neither species showed aggression, the scientists concluded that the dolphins and whales were engaging in a playful social activity – or what a non-scientist might call "a game". You can check out some photos in the video below.